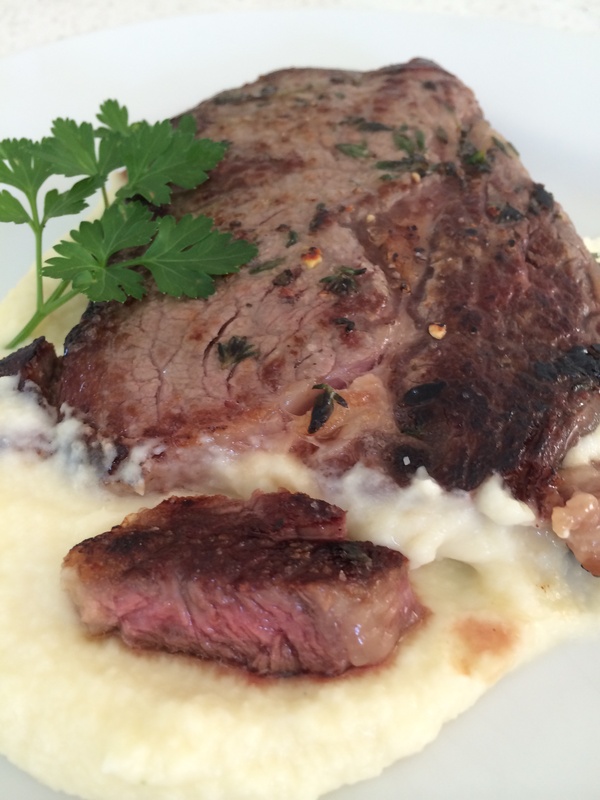 http://www.recipecommunity.com.au/main-dishes-meat-recipes/perfect-sirloin-steak/172669 Whoah, this is super cool. If you’ve ever wanted to try sous vide then this method from Gary Mehigan ( Australia’s Masterchef judge see link above) is a perfect way to start. I used two scotch fillets and put them into a snap lock bag with thyme and olive oil. They are cooked in the steamer basket at 50 c for 45 minutes with a litre of preheated water in the Tm bowl. 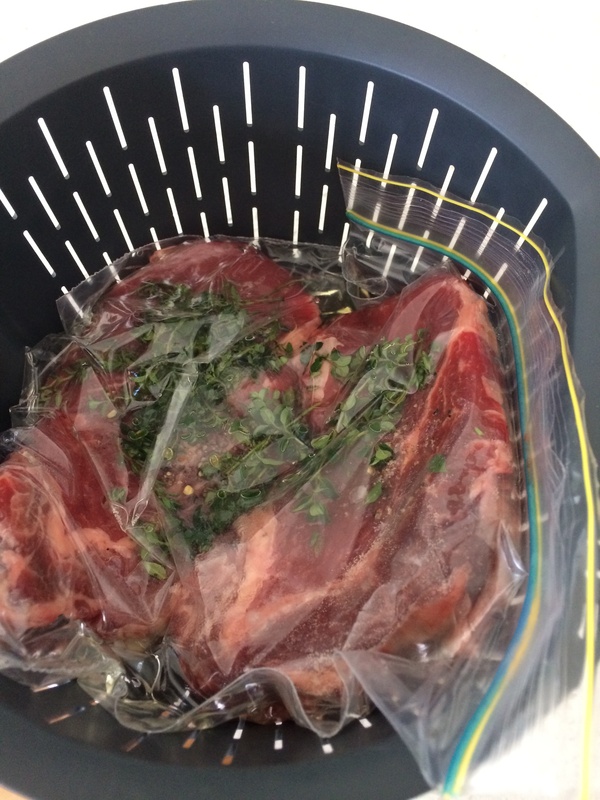 ( for Tm5 you will need to put water to just cover the steaks, Gary’s recipe was created for the tm31 which has a smaller bowl size ) It’s important to make sure the seal is closed completely so no water can enter the bag. See below for a tip on how to make sure the air is taken out of the snap lock bag. Once finished cooking, take steak out of bags and they’re ready to pan fry 1- 1 . 5 minutes each side, comes out perfect medium rare steak. 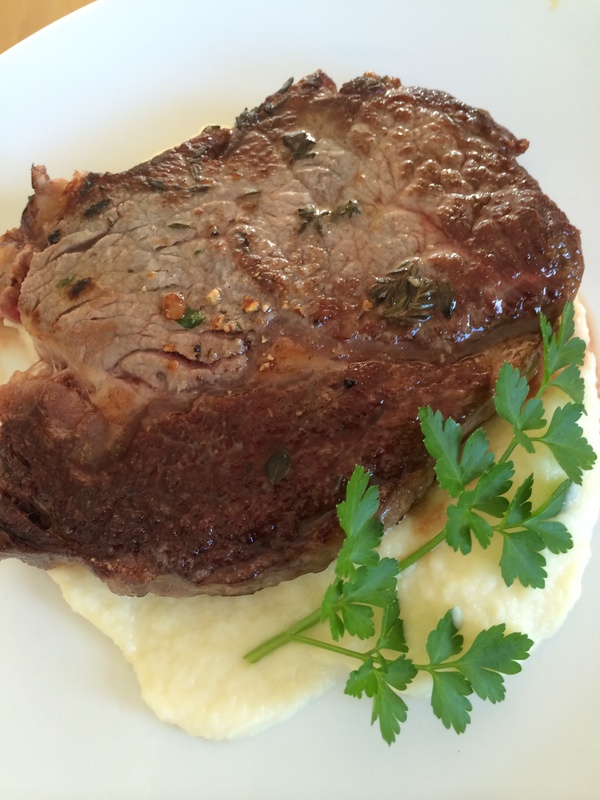 So tender and juicy and infused with that wonderful thyme flavour. Simple and amazing. “Sous Vide literally means “Under Vacuum”. If you do not have a vacuum sealing machine you may be able to expell most of the air by using a ziploc bag and submerging it in a bowl of water until only the zip part of the bag is exposed. Zip the bag closed and then remove it from the water. (Do not allow water to enter the bag)”. Served on cauliflower purée recipe found on the back of a Stevens flyer courtesy of Ben Bayley. Miss 8 demolished one steak while my back was turned. And it got the big tick from Miss 14 too. I’m thinking this would work perfectly for thai beef salad. Not sure how you would increase the quantity of steaks or a large family but he has some good tips for saving the precooked steaks in the fridge and browning off later. So you could sous vide a few batches ready for the BBQ later. Add cauliflower to TM bowl, blitz gradually to a paste at speed 8 for a few seconds. Add rest ingredients, cook 20 mins, 100 C, speed 2. Then blend gradually from speed 1 to speed 10 for a minute until a fine purée. Keep warm. Nb this does make quite a bit of purée but it’s delicious on it’s own too. Like a light cauliflower soup.